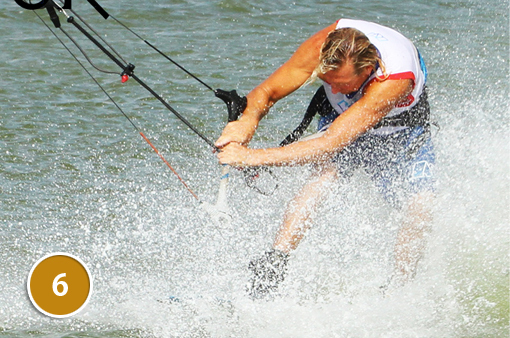 Everyday small progression in kiting is an important thing and also the most rewarding challenges. In freestyle the possibilities seem endless, moving from a blind landing with surface pass, to an air pass blind judge and then adding that extra bit tars blind judge three and then a five and then a seven – one can but dream or admire those that actually can. Anyway the point is to those non-freestylers it all can look a tad uncontrolled with a lot of splashing, but if it’s your thing then every extra 90° or so means s00000 much. Taking your Shifty 3 and moving it on to a 5 is a highly rewarding yet achievable challenge – so here’s how. To make that extra turn to toe side you’ll need more time. There are a few options available to you here. You could put your kite higher, which will help but the higher it is the more strength and effort you’ll need to pass, which may slow down your rotation. From the above you can check that rider is not coming into this with his kite at 45°, but as so often it won’t be above 11 o’clock as you must be able to edge against it, and any higher it’ll be lifting you – 10.30 is perfect.He’s come in with good speed and the kite parked still, with all his weight back over the tail of the board. 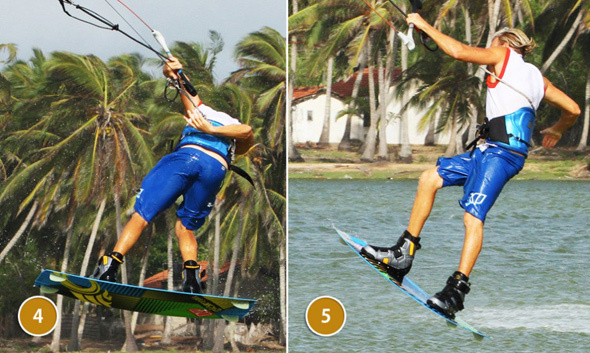 He’s carved up hard and low and at this point has popped aggressively by stamping against the board, allowing his legs and body to fully extend upwards in an effort to get as much height as he can with this kite angle. His effort is focused ontwo things simultaneously, pop for height AND keep the bar as close aspossible. You don’t want your arms getting pulled out straight. As you’ll no doubt know from your Shifty 3s, kicking the back leg out is to help with your rotation and if you happen to have a stylish shifty it’ll look better too. As soon as he is free of the water the rider kicks his back leg out, winding up some energy for his rotation and pass whilst keeping his elbows and hands in. This way he’ll be able to pull harder and swing his leg further. This is a crucial step as the closer you get yourself to the bar, the earlier you’ll be able to pass it and more importantly the less it will pull away from you once you have passed it. Remember that your airs is to go a little earlier so as soon as you have kicked your leg back, pull and go. You need to pull yourself up and over the bar whilst swinging your front leg under your elbows to get you rotating. This is a kite face moment as the effort should be extreme maybe even allow yourself a little grunt! You can see that in comparison with the last picture where the rider head was level with the bar, he now has the bar coming in and down below his chest. And even though he has swung his back leg through and has started to rotate he still has both hands on the bar as he is still pulling himself up to it. The passing action will be similar to your 3, that is to say you’ll be leading with your head and shoulders, turning yourself down and around, away from the bar, releasing your front hand, twisting the bar and then immediately hunting for the bar on the other side. If you popped hard enough and pulled hard enough you should get some slack here from the kite, which will help as the bar won’t get pulled out from you. That said the main difference here to the 3 is if you look at the rider, you’ll see that his back leg is lifted with his knee coming up towards his chest. This is the precursor to getting the toe side landing, you really have to commit to this during the handle pass, otherwise your feet and the board will drop away from you and you’ll have no chance to go that little bit further. And here is the result of bringing that knee up. With the knee up the rider can then bring it through towards his hand. The action is similar to that of a back roll to toe side, even though your adding the toe side on at the end you have to finish the roll with your back knee high so that you can push it through. It’s also important to keep the bar close, by that we mean don’t let your front arm fully extend as then you’ll used to Shifty 3s the chances are your muscle memory will encourage you to just drop out of the pass. Here you must keep your head turning so that it’s looking forward as this will allow you to turn your shoulders further so that your legs and upper body are moving together. Just think how you learnt the side by taking the front hand off so that your shoulders could twist around. Here you can’t let that hand go so you’ll need to turn your head. This is almost THE top tip as well as being the final thought to ponder, as once you get your head around what is going on, aiming for this from the moment you think about passing will help you get the 5. If you fry your damnedest to land with both hands on the bar it will make you turn your shoulders even if it doesn’t get on until you splash down, as is the case with our rider here in image. If you do the kite will pull all through the move and it’ll be twice as hard. If you can think of only two elements of this move, they are to lift that back knee as you pass and fry to land with two hands on the bar. If you’re dropping down out of the pass as per normal for a 3, take time to visualize what you’re aiming for. Then give it another 30% on your next try and think about bringing that knee up and landing with two hands. If you’re getting around but then fall on your back once you land. This means the kite is pulling you too much once you’ve passed, so either trim a little more or pull harder into the pass. If you don’t have time, go earlier and try to get some more height with help from the kite.